Discover modern country living in South Texas. 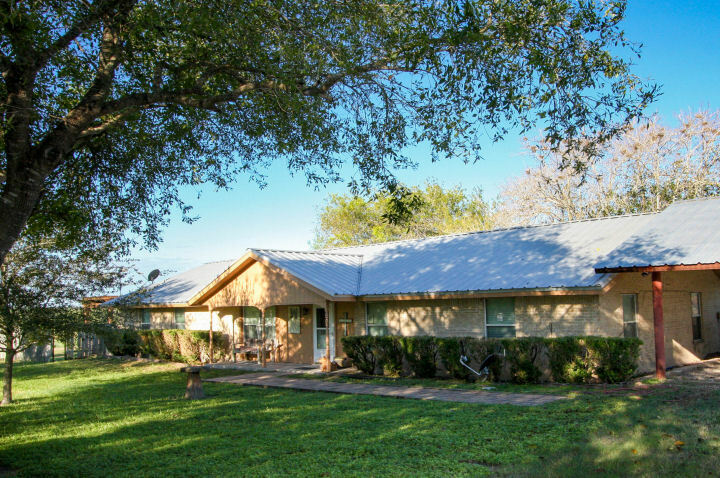 This inviting, 10-acre ranchette near the heart of George West, TX offers everything you could ever want in a ranch home. Here, you will enjoy the bona fide farmhouse lifestyle in all its unadulterated, natural tranquility. Still, this address will never make you feel too far removed from the main urban centers of South Texas. 165 County Road is a 4-bedroom, 2-bathroom custom home with features that capture the full experience of ranch home living. Built in 1974, it was beautifully restored for the modern homeowner. The historic cabin home has a generous living space spanning 2,190 square feet. Its exteriors are freshly repainted to greet its new owner with a lively, welcoming sheen. The kitchen space is defined by impressive finishes all around. Expect imported Italian tile countertops, custom wood cabinets, and stainless steel appliances to be included in this excellent deal. Absolute comfort is guaranteed in the master bedroom, where the tile flooring is complemented with classy carpeting. Exceptional storage in this room comes in the form of generous his/her closets. The main bath is another highlight in this home. The oversized custom showers are a perfect way to freshen up after spending a day’s worth of work tending to your farm’s needs. The custom wood vanity and hammered copper sink create an elegant space for even more pampering and grooming. This home also features a fully outfitted laundry room with its own cabinets, tile countertops, and space for an additional refrigerator and freezer. In the mood for some warm South Texas sunshine and stunning landscape views? The expansive living space flows out onto a large outdoor deck that features an elegant pergola. Beyond the four walls of the primary residential building are 10 sprawling acres of land that accommodate a 4-stall horse stable, 6 dog kennels, a hay barn, and a calf shoot with 2 roping boxes. A roping arena is already pre-built within the premises, so you can start working on mastering your cowboy skills right away. For your parking needs, the lot includes a covered parking space that can accommodate up to four trucks. One of the best qualities that this charming ranchette offers is its convenient location. It is located 5 miles southwest of the George West city proper. This is just an easy 10-minute drive to the downtown area. It is also just 35 minutes away from Beeville (30 miles eastward), an hour away from Corpus Christi (75 miles to the southeast), and 1.5 hours away from San Antonio (90 miles heading north). Want to schedule a viewing of this home? Get in touch with us at Desert Flower Realty today at 361-449-2051 or DesertFlowerRealty(at)DesertFlowerRealty(dotted)com. Our local specialists are eager to show you around the best residential and ranch real estate opportunities that South Texas has to offer.